So you want to learn the Knightly arts? If you want to become a swordsman in the lineage of our ancient Catholic brothers – the Knights – you’ve come to the right place. This group is the closest you are going to find in the 21st century, where the combination of martial arts and Catholicism are intertwined. We do not study theatrical fencing, where entertainment is the goal; nor do we study any form of sport fencing. Here you will learn the style of sword fighting used on the battlefields and dueling rings of Europe from the 13th to the 17th centuries combined with the spiritual combat teachings of the great saints of the Church. Bladed combat hastened toward obsolescence with the advent of gunpowder and was helped along by the proliferation of armor. The techniques of the sword and other weapons were soon forgotten. They would have been lost completely had it not been for a few of the old masters who wrote manuals on their art. As we rediscover and translate those old manuals in 14th and 15th century German, Italian and Latin, we are fascinated at the rich display of fighting techniques our ancestors used, as well as the complexity and completeness of their art. Please note that in the first paragraph we do not “teach” this art, we “study” it. The ancient fight manuals were not written for beginning students, nor is the written word a satisfactory substitute for a living teacher (think of golf; a pro can teach you the basics of a golf swing in a short time, but if you try to describe the act on paper, you will either find that you have missed many of the finer points, or you will write pages on even the simplest swing). So, if you attend our training sessions, we will teach you what we know and have interpreted to date. It will not, however, be some dojo where you spend years always learning from the same black belt. Once you have developed an understanding and skill in the of the use of the longsword, you will be like the rest of us, on the path of constant learning and rediscovery of an ancient art. Most people today would laugh at the very idea of Spiritual Warfare. Why? Because many of the enlightened people today don’t believe in the existence of a spiritual reality, or a Jesus who actually performed miracles, or that the angels and demons are fighting all around us. However, spiritual combat between angels and demons for our souls is as much a reality as the existence of your local parish building. One side wants to win the battle so that they can drag us down to hell for eternal damnation, and the other side wants to win to take us up to heaven for eternal bliss and happiness. The demons are definitely an enemy to take seriously. “The Devil only Tempts those Souls that wish to Abandon Sin, and those that are in a State of Grace. The others belong to him; he has no need to Tempt them. By learning the lessons of the sword and Medieval and Renaissance martial arts, we grow in our ability to respond in a timely and effective manner. Our studies of spiritual warfare teach us about the content of our responses. When we combine these two aspects, we get the ability to respond quickly, decisively, and effectively. Additionally, as brothers-in-arms, we give each other support in our trials and help encourage each other to continue through our spiritual journey. 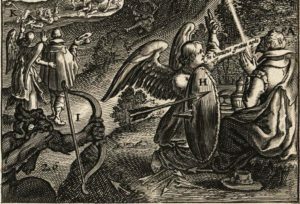 The Catholics on earth are often called the “Church Militant” as we are to fight a spiritual battle “against the principalities, with the powers, …with the evil spirits in the heavens.” Do not shirk your duty – stand and be counted with forces of light! We currently have 2 study groups in Texas and several others across the country in various stages of formation. You can check out our Study Group page for details about our official groups. If your location is not listed, please contact us about formation. We can help you to get a study group up and running. We always welcome serious-minded students as new members. Most of our groups hold training sessions on Saturday mornings, but for exact times and locations please check out each study group’s page. (see “Where to Find Us“). Students are encouraged to show up 15 minutes early to stretch and warm up. Training Uniform – New students should come to class wearing a plain white t-shirt (no pocket) and plain black warmups (no logos, stripes, sport shirts, etc. on either). Wear some sort of athletic shoes with a decent grip (shoe color doesn’t matter) so that you won’t slip while fencing. No jewelry, watches, belt packs, etc. are allowed to be worn during training as they could get broken and present a safety hazard. Glasses can be worn, but we do recommend safety glasses if you have them; you will also want some sort of eyeglass band to make sure they stay on. Equipment – To start historical fencing, all you will need some sort of wooden sword (waster) to practice with. Our club may have wasters on hand for temporary use, but a student may begin with a wooden dowel (See “Wasters” in the Equipment Section for specifics and details regarding wasters). The longsword is the foundation for the new historical fencer in regards to combat with all Renaissance close-combat weapons. For this reason, all new members first study to develop core skills in basic and intermediate longsword techniques. Upon the successful demonstration of proficiency, the member will be allowed to test for his Knight Scholar ranking. The Rosary, named by many as the preferred weapon of spiritual warfare, along with basic prayers and an understanding the power of sacraments and sacramentals, will be a key part of the training. We look to build core skills in these areas as much as in physical martial arts. Basic Stances and their German and English names. Training of basic cuts, stances, and other historical fencing techniques is performed with a waster (wooden sword). Students will begin sparring using wooden weapons, and as they become more proficient with control of the weapon, they will be allowed to progress to sparring with blunted steel (See ” A Few Words Regarding Sparring” below). While the longsword is our foundational weapon, it is equally important for a martial artist to be exposed to different weapons and modes of combat, such as unarmed combat and unarmed vs. armed. The typical training warmup routine will remain based on the longsword throughout the year to develop fundamental skills, but the Group Study portion of training will vary throughout the year as we explore these alternatives. Sessions may cover single sword, sword & buckler, sword & dagger, rapier, messer, quarterstaff, dagger, grappling, or other possibilities as long as manuals are available for study. Our usual sessions are held on Saturday mornings for about 2 hours. Each study group is free to set their own schedule and this sample is based on a start time of 10:00am. We do recommend that our members arrive 15 minutes early to stretch and begin warming up. 10:00am – Training Begins (All Students) – Following an opening prayer, the entire group begins basic warmup exercises. 10:20am to 10:50am – Course Study – Official course study begins. Beginning and advanced students will work together on techniques and concepts for the given weapon being studied that month. Students will be expected to acquire appropriate equipment prior to starting a new weapon; new students may be loaned equipment on a short term basis only. 10:50am to 11:15am – Spiritual Exercises – Study group members will work on spiritual exercises, and spiritual warfare texts. 11:15am to 12:00pm – Free Study/Sparring – For the last 45 minutes of training, students may choose to continue working on the Course Study material, practice independently, or engage in sparring. We recommend sparring as often as possible. Note: The group will occasionally hold a special sparring session or, at the discretion of the study group leader, an entire Saturday may be dedicated to sparring. On those occasions we skip the usual warmup and engage in sparring for the entire morning. The idea behind our study is to learn and master an ancient art of combat and link it to our faith and spiritual warfare. The old German masters had the philosophy, “Was Sehrt, Das Lehrt” (What Hurts, Teaches). Lack of pain when being hit will destroy the individual’s respect for his opponent’s weapon, turning a “lethal” duel into a pillow fight. A fighter develops parrying and voiding reflexes because getting hit doesn’t feel good. These exercises help to prepare each man to weather the spiritual challenges and pain that may be experienced in defending our families and growth in our faith. Wooden and blunted steel swords require the user to practice controlling the blow, reducing the strike to a non-injurious level while still moving with proper speed and energy for fighting, what we call “intent.” Even so, accidents do happen. While serious injuries are almost unheard of, minor injuries such as bruises are not uncommon, cracked and broken fingers are rare, and head and finger protection is strongly advised (see our section on equipment). Before the fencer will be allowed to spar his classmates with these, he must demonstrate that he can control the weapon effectively. These are never used in mass combat matches, as the adrenaline level and lack of control during these matches makes their use unsafe. Q: What is MARE or WMA? I’ve seen that in some articles on sword fighting. WMA stands for Western Martial Arts, while MARE stands for Martial Arts of Renaissance Europe: the combat techniques used in Europe, and specifically, for our purposes, the fighting styles and techniques used in Europe during the Medieval and Renaissance periods. You may also see it referred to as HEMA (Historical European Martial Arts) or RMA (Renaissance Martial Arts). EMA, however, refers to Eastern Martial arts; those originating in Asia. Q: Martial Art? But this isn’t karate! That is kind of like saying, “An automobile? But it’s not a Toyota!” The term “martial arts” refers to “the arts of Mars, the god of war”. In other words, any combat technique. Technically, even what the military teaches today is martial arts, even though it now involves assault rifles, grenades, and carpet bombing. Thanks to television and movies, the first things that pop to most people’s mind when you say “martial art” are things like karate, kung fu, Power Rangers, Crouching Tiger Hidden Dragon, American Ninja vs. Godzilla, etc. For years, it was commonly thought that the European fighting man was little more than a Neanderthal with a big knife. We have since learned, however, that he had a fighting system every bit as complex, effective, and beautiful as that of the samurai. Q: Do you do any reenacting? No. We don’t reenact battles, we don’t dress up like elves (although we do have a historical fighting uniform we use for demonstrations), and we don’t have tournaments. We are simply interested in learning about and mastering the art of historical swordplay (although we do have a lot of fun dueling with each other). Q: How does your group compare with other Catholic men’s groups (e.g. Knights of Columbus)? Other Catholic men’s organizations are wonderful (and we highly recommend joining them! ), but they are focused on fraternity and service. While a well-rounded faith life must include acts of charity and service, our group is unique in our method of outreach to men. We are building martial skills and relating it to our faith in a uniquely masculine way. Doing this not only prepares men for spiritual warfare, but connect our members to the Knightly heritage that all Catholic men are privileged to enjoy.